Yesterday we took a little day trip down into Italy. 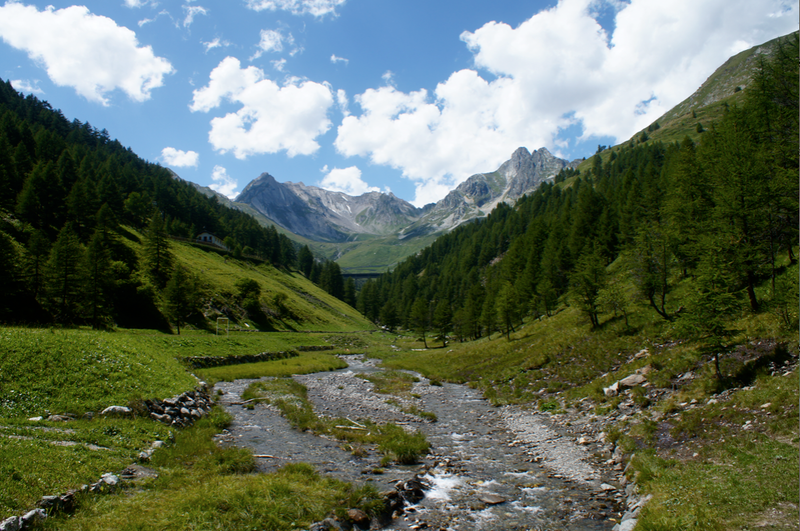 My uncle Tim has been staying with us in Verbier recently and he decided to take us for lunch at a little place just over the Grand St Bernard Pass as a thank you. It was such a lovely day. 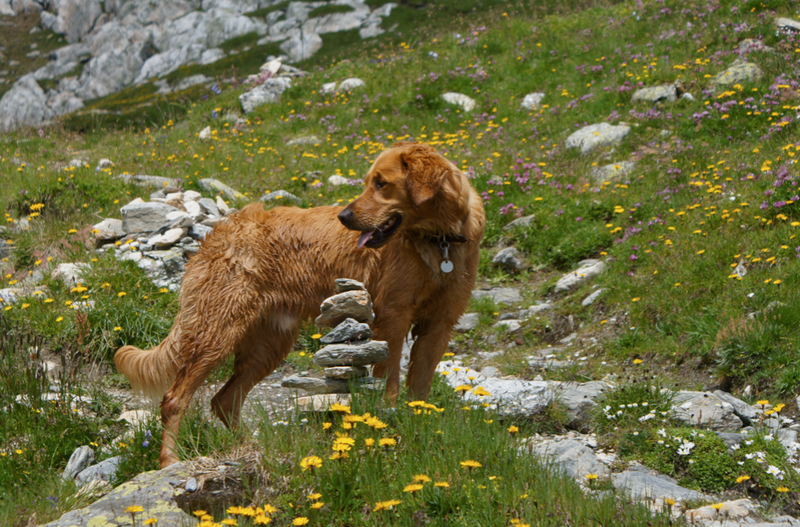 We went on two walks with the dogs - one before lunch up at the top of the pass among all the mountain flowers and rocks and then a second afterwards in the green and grassy valley. We ate a delicious lunch of local dried meats and a variety of pastas. Afterwards I introduced mum and Tim to affogato, one of my favourite light puddings (it's a scoop or two of vanilla ice cream or gelato drowned in an espresso - the perfect creamy end to a heavy meal). Our trip to Italy brings me nicely to one of my favourite desserts: tiramisu. 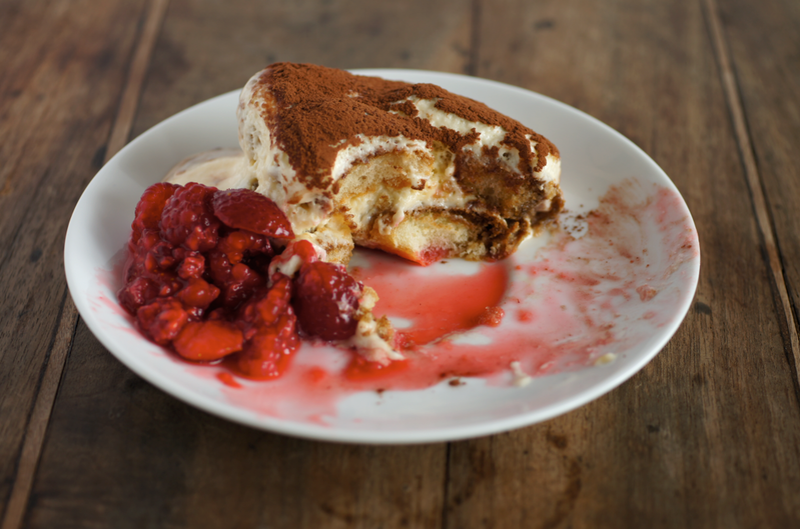 I made tiramisu for the Daring Bakers before but the recipe was very complicated and slightly too sweet (though I loved making my own marscarpone and savoiardi). Mum was given this recipe on a piece of paper by a lady in Italy last autumn. It has made tiramisu a regular fixture in our house. My uncle Tim has become a little bit obsessed by it and so mum has been making it on overdrive. It's surprisingly addictive. I made it for my birthday BBQ a few weeks ago and for the first time paired it with a bowl of macerated strawberries and raspberries. A whole new level. I tried the combination for a second time last weekend for a dinner party we were bringing dessert to and it had great reviews again. It's a fabulous recipe I'm sure I will keep on making it regularly for many years to come. Separate the eggs and place the yolks and caster sugar into a mixer. 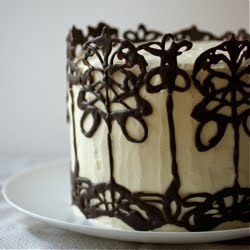 Whip until pale and thick - the whisk should leave a trail when lifted. In a separate big mixing bowl, beat the marscarpone until smooth. Add 1/3 of the yolk mix and fold until combined to loosen. Add the rest and fold until smooth. Wash the mixer bowl and dry carefully, then whip the egg whites until stiff peaks form. Fold a third into the marscarpone mix, then finally fold the rest in. Briefly dip each spongefinger into the coffee then place into the bottom of a big serving dish. Keep going until you have a full layer over the bottom. Spoon over half of the marscarpone mix. Make another layer of spongefingers then finally spread the rest of the marscarpone mix over the top. Put in the fridge and chill for at least 4 hours before serving. Just before you serve dust the top liberally with cocoa powder. Place the raspberries in a medium sized serving bowl. Slice the strawberries and add them. Sprinkle over the sugar and lemon juice and lightly stir. Leave for at least an hour, stirring occasionally. 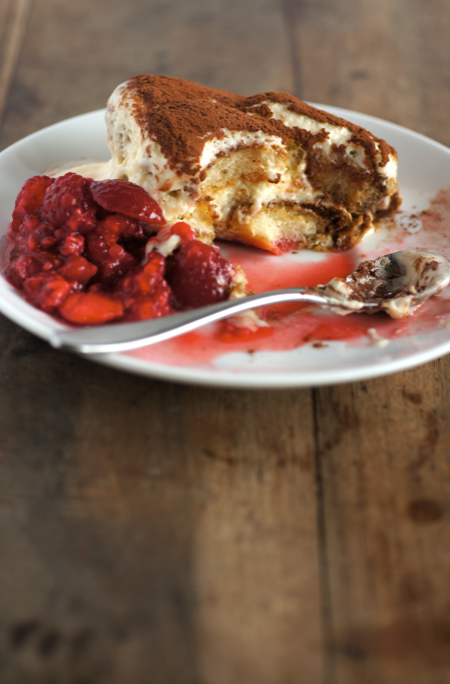 I love Tiramisu- such a decadent, creamy, delicious dessert. This looks a great recipe. And I always think great recipes have a great story behind them, just like yours, how lovely to have been handed it in a cafe! I love tiramisu too, but I haven't tackled that DB one again either. This looks easier and delicious, and I like the idea of serving some fruit on the side. Oh, and McVities was the most recommended digestive brand, so you're not alone in your brand loyalty! Your Tiramisu looks gorgeous! Most recipes I've seen have some sort of alcohol in though, do you think it's better without? I always like something tart and fruity in a dessert, David Lebovitz says that you are either chocolatey or fruity in taste, and so I never really make chocolatey ones, this is a great combination of the two, thank you !!! What a refreshing idea to serve tiramisu with summer berries! Got myself some savoiardi fingers already and with imported berries quite fresh now in Singapore, will have to make this pronto when I get back. Sorry it has taken me ages to reply! thelittleloaf - I agree - it can so easily be done badly. I wasn't even sure I really liked it until I found this version! Mary - The DB one was just a bit mental, I remember it taking me days. Tiramisu is more of a homey dessert to me so that recipe didn't really fit. And wahoo for McVities! hungryhinny - I was going to mention that but I forgot! The original recipe doesn't have alcohol anyway but my mum also can't drink so I wouldn't have added it at first. I've come to really appreciate it without - I think the delicacy of the flavours get masked by the alcohol. pickyin - the fruit just somehow lifts it (and looks pretty!). Do give it a go, it's so delicious. whip cream steady, do not add sugar. works the mascarpone and sugar with a fork first, then with the whip to make it pretty soft. take part and a part of mascarpone cream and lavorali to mix well, then join the remaining mascarpone mixture and then mix again for the remaining whipped cream, the latter moves from top to bottom to disassemble and then proceed as usual. monta la panna ben ferma, non aggiungere zucchero. lavora il mascarpone e lo zucchero con una forchetta prima poi con la frusta per renderlo bello morbido. prendi una parte di mascarpone e una parte di panna e lavorali per amalgamarli bene, quindi unisci il restante mascarpone, mescola ancora per amalgamare e infine la panna montata rimasta, quest'ultima con movimenti dall'alto verso il basso per non smontarla, poi procedi come solito. In situation, file s get deleted you can get them from the Back again up files. A melhor loja online de venda de esteroides (www.bodygladiators.com).